Ricky Miller is still seeking his first Posh goal. It’s been a tough introduction to life in League One for much-hyped summer Peterborough United signing Ricky Miller. The boy from Bretton has collected more cautions for simulation (2) than he’s scored goals (0), but he hasn’t lost the backing of manager Grant McCann, or from the pocket of fans who sing his praises at every home game. Gwion Edwards could be back for Posh against Gillingham. Miller is set to start Saturday’s (October 14) home game against lowly Gillingham and McCann is backing him to set off on a scoring run once he breaks his frustrating duck. “Ricky is a good player and nothing I’ve seen from him this season has changed my mind,” McCann said. “He’s had a lot to deal with after missing the first six games because of suspension and he’s had no luck on the field. “He should have won the team a penalty at Oldham and he should have won another penalty against Northampton last week when instead he was cautioned. “But I can see Ricky is learning quickly. “Obviously he’s desperate to score that first goal and once he’s managed that he will go on a scoring run. “He’s been unfortunate not to score already. He’s been denied goals by good saves and he’s hit the woodwork. “You can see he’s trying hard for the team and his rewards will come. 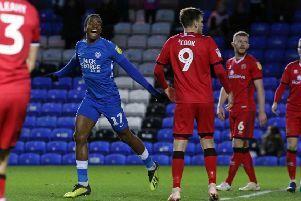 A long-term injury to Junior Morias and the inexperience of teenager Idris Kanu will probably keep Miller in the Posh starting line-up alongside top scorer Jack Marriott, unless McCann decides on a formation change. Danny Lloyd could possibly replace Miller albeit in a sligtly deeper role. Posh have been boosted by the return to action this weekend of free-scoring midfielder Gwion Edwards. Edwards picked up a groin strain in the first-half of the 3-2 win over League One title favourites Wigan on September 23 and hasn’t played since. Posh have failed to win any of the subsequent three matches proving Edwards’ worth to the side. Fellow midfielder Callum Chettle could also be available on Saturday after recovering from a long-term hamstring injury leaving Morias as the only absentee.